First a note about this “review”. 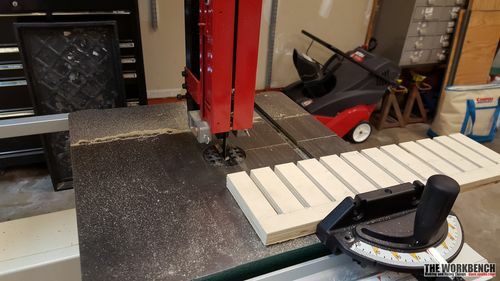 This is more of an informational post, not so much of a review as I have not owned a bandsaw before, and therefore have nothing to compare it to. 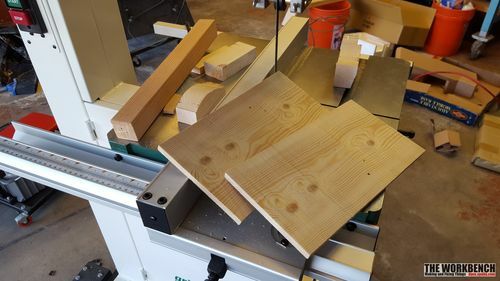 Having a bandsaw in the shop opens a completely new avenue of possibilities in the way wood is cut: everything from making accurate curved cuts to resawing. The resawing ability itself is enough justification to own one, and the main motivation behind this purchase. Of course the Delta, Jet and Powermatic were evaluated as well. 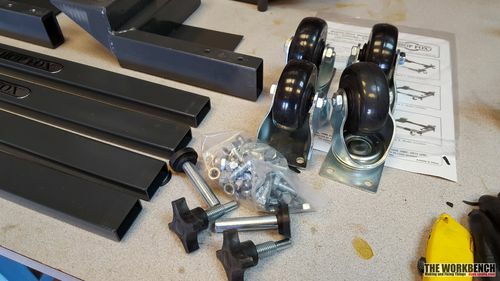 Also, the eBay and Craiglist offerings were looked at, but most of those saws had a hard life, I did not want to spend a lot of time and money refurbishing. The Harbor Freight saw is basically junk, parts literally broke in my hands as I was adjusting the guide post at the store. The Laguna is very nice, but pricey for a 14” saw and the mobile base option was another $150 (the saw does not even come with a blade). The Rikon looks promising, but the model I was interested in is now discontinued and cannot be purchased locally. Value for money, the Grizzly G0513 is hard to beat. It’s a 17” with a 12” cutting height and has a 2HP motor. The mobile base option only costs another $75. With shipping, including the lift-gate service, the total was just a bit over $1000. 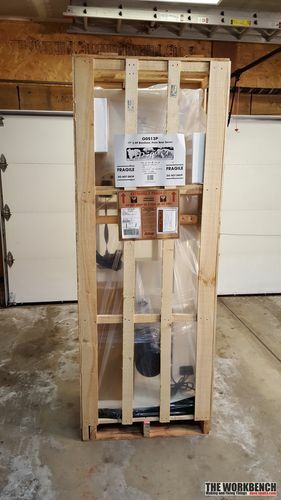 The saw arrived within a week of ordering it (it would have been the same week if I had not missed the call to schedule delivery). 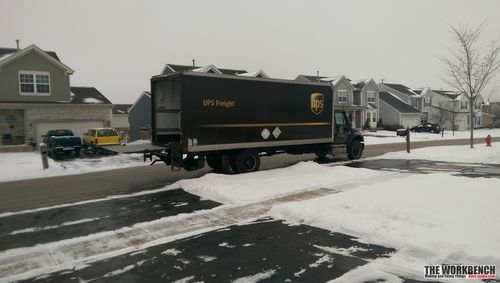 It arrived via UPS Freight, the truck had a huge lift-gate that made the process much easier. 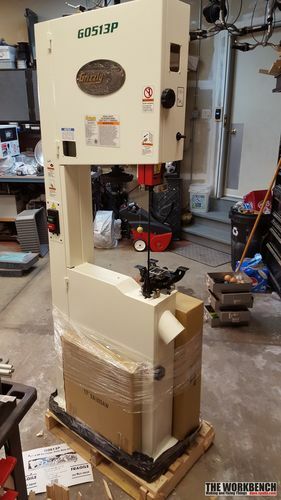 The driver actually used a hand truck to position the saw on the lift-gate, but also to put it right in the garage: fantastic service from UPS! 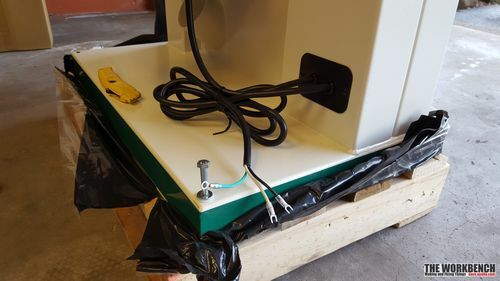 The saw was packaged well, mounted to a pallet and crated in with styrofoam inserts. Once all that was removed, then the assembly could begin, starting with the mobile base. 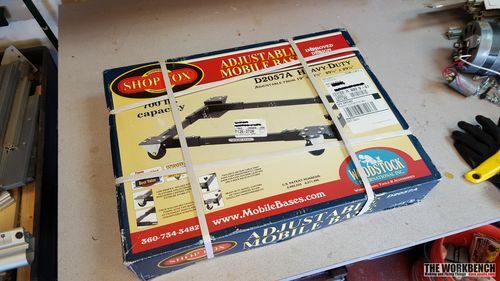 The Shop Fox mobile base is a universal kit that can be adjusted to fit many different types of equipment. In this case it does not quite fit to the exact form of the saw base. 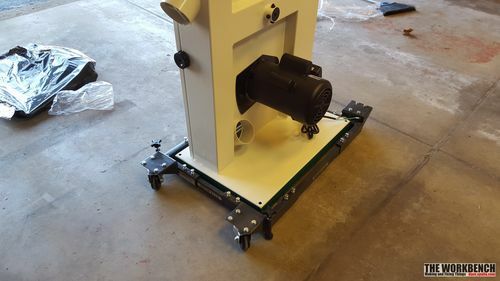 Assembly was straight forward, but the stationary casters were a little tricky to get installed, a small screw driver was needed to guide the nut and lock washer onto the bolt. 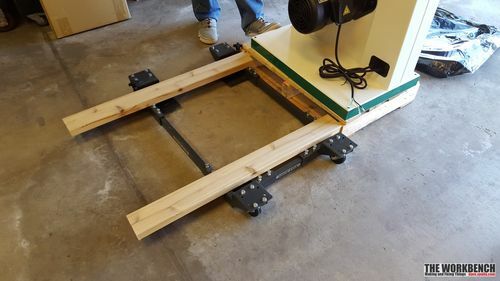 It should be noted that a piece of 3/4” plywood was needed for the saw to sit without wobbling because the four steel plates that the saw rests on were not all straight and level. 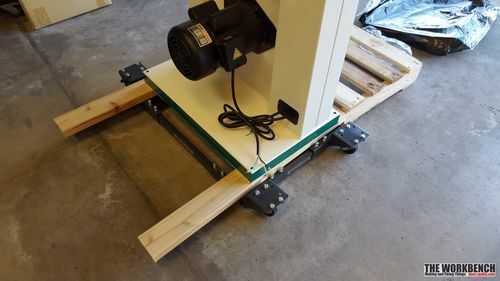 With the base assembled, it was time to move the bandsaw from the pallet. First the four lag bolts holding the saw in place had to be removed. Next, a couple pieces of 2×4 were placed onto the mobile base. The saw was slid onto the 2×4s then tilted to one side, one was removed, tilted to the other side and the second one was removed. These pictures do not show the plywood that was added later. The cast iron table was clean with paper towel and WD-40 and fastened to the saw. The fence was then attached to the table and the final step was to wire the motor for 110v (was pre-wired for 220v) and a plug was attached. Once assembled, blade tension set and the table zero’ed out, a few test cuts were made. The included blade worked well cutting the pine scraps, and resawing a 6” piece was like cutting through butter. 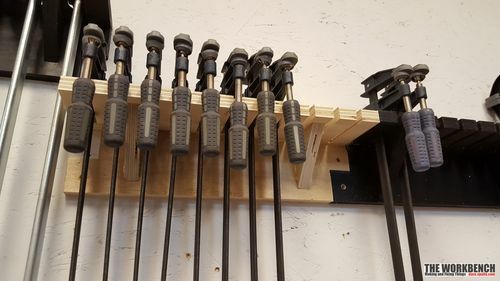 After that I made three more clamp racks using the leftover 3/4” plywood. The saw performed fantastic, runs smoothly and is surprisingly quiet. Bottom line: A very worthwhile purchase, quality constructed and works great. What a GREAT NEW Toy you have to play with! You got the BIG one from Grizzly… I have the small 14” 555 and like it a lot! Band saw boxes and resawing is fun too! A new world of fun! Enjoy & be safe… Always keep your hands NOT in line to the blade… NO MATTER WHAT is my #1 Rule. ... you never know when your cut will spurt forward without notice and surprise you… Be ready 100% of the time! Take care… & Thank you for sharing! Bob, the research I did supports your satisfaction with Grizzly, that’s why I purchased it sight unseen. I do have a grizzly brad nailer I bought back in 1998 and it still works great. I own the Grizzly G0513X2BF, it will be four years in July. Not a hiccup, save for a pretty routine tire change around the 30 months mark, since I run it so much. I also have a Porter Cable 14” which has been nothing more than a PITA, so I was going to replace it with a high end 14” when it hit me, why not just get another Grizzly. I probably will get another G0513, and might even get a twin to my first one since I am totally hooked on the electric blade brake. You have chosen well, and I also have a Grizzly 15” planer that is actually almost five years old now and is still a horse every time. Service is good, machinery is good value for the money, and you will do things with wood now you could only imagine before! Well, consider THAT one “broken” ! Thanks all, I hope it lasts a very long time. Those will be great additions to your shop. Thank you for sharing, and have fun with it.